With the rise of open offices, huddle rooms are becoming more important for collaboration and small group meetings. Polycom wants to capitalize on this trend, and the RealPresence Group Convene video conferencing solution is made for for meetings and video conferencing inside smaller workspaces. Designed for huddle rooms, the RealPresence Group Convene video conferencing solution can broadcast your video chats at 60 frames-per-second in 1080p resolution. Businesses can setup the Group Convene solution with a single monitor or a dual-screen display for better content collaboration. With a dual-screen setup, the video feed would appear on one screen and users can view a shared presentation on the second display. Additionally, users can even mount the camera to the wall. Polycom says that the system integrates natively with Microsoft Lync 2013. The RealPresence Group Convene works with Polycom RealPresence Group 500 and the new RealPresence Group 310 video collaboration solutions. Polycom says the installation process is simple, and the compact design can deliver high quality audio and clear video. 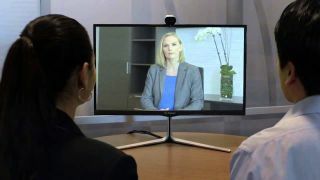 "Content...is easily shared through direct HDMI or VGA connections, or by using the Polycom People+Content IP application," Polycom said in a statement. "These improvements allow participants to share everything from animations and videos, to medical diagrams and CAD drawings, with the same full, rich detail they see on their own computer screens." The solution works with other Polycom software and hardware accessories, including SmartPairing, which allows users to annotate and share documents on mobile devices, the EageEye IV camera with optical zoom and optional wide-angle lens and EagleEye Producer for facial recognition. The Group 310 solution also comes with NoiseBlock to cancel unwanted background noise. The price for the Group Convene and Group 310 system is $5,000 (£3,191, AU$6,260). The solution will also compete against Logitech's ConferenceCam Connect.